Bring a deep pan of water the boil. Add the vinegar. One at a time, crack the eggs into a cup and then slip the egg into the barely simmering water. Reduce the heat, if need be, to maintain that low simmer. Cook just until the whites are set and the yolks are still soft, about 3 minutes. Using a slotted spoon, transfer each poached egg onto a clean dish towel to drain. Trim the edges of any streamers so they're nice and tidy. Place a pan of water over a high heat and bring to the boil, reduce the heat to a simmer. Combine the egg yolks, lemon juice, and water in a small metal bowl that will fit snuggly on top of the pot. Whisk the mixture constantly over very low heat until the eggs double in volume and thicken. Immediately remove the pan from the heat but continue whisking for 1 minute. Add the salt, pepper, and cayenne. Cool slightly. Drizzle in the melted (but not hot) butter in a slow, steady stream, whisking all the time, until it is well-incorporated. Taste and adjust the seasonings, if necessary. Be careful at this stage that you do not add the butter to quickly as it may split. 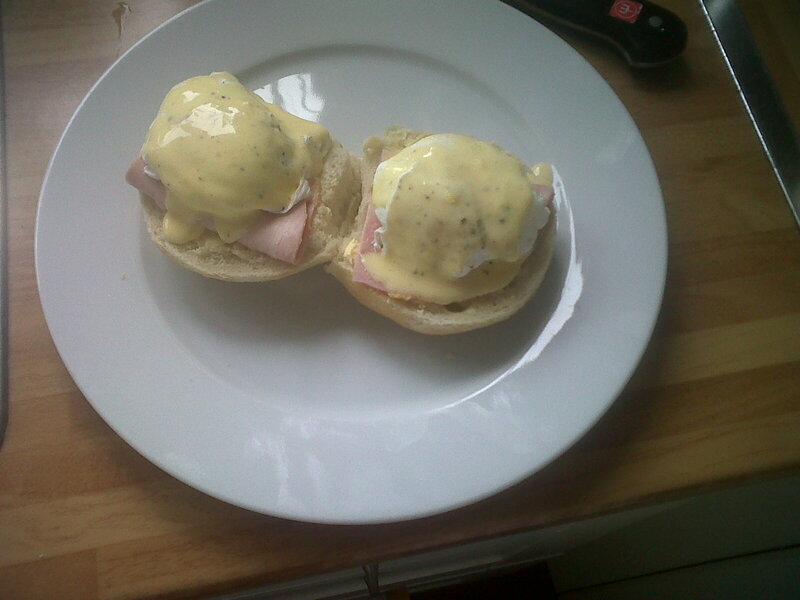 To keep warm; place the Hollandaise Sauce in a bowl over hot water, stirring occasionally. Start by preparing the Hollandaise Sauce. Keep it warm but do not let it boil. Start the water for the eggs. Warm the ham slices, and toast and butter the muffins or crumpets. Keep them warm in a warm oven. Finish preparing the Poached Eggs. To assemble, place a slice of ham on top of each toasted English muffin half, place a poached egg on the ham, and spoon a little Hollandaise Sauce over the top. Serve immediately.